Products: All our test prep products are produced by court reporters and degreed educators for court reporting students, CART Captioners, reporting novices, and expert reporters. Services: Private tutoring, consulting, and career coaching with Monette Benoit, the Court Reporting Whisperer. Effectiveness validated by thousands of students, teachers, court reporters, and CART Captioners since 1990. Thousands have discovered the CATapult CDs Software Program series for court reporters, CART providers, captioners and students; the NCRA RPR, RDR WKT Written Skills Books; and five Handbooks for Reporters, Captioners. 1. What is the REVISED, Complete NCRA RPR, RDR, CSR Test Prep WKT Textbook – Updated, 6th edition; the Test Prep Workbook – Developed as a testing resource to accompany the “Complete NCRA WKT Textbook”; Test Prep Companion Study Guide; interactive WKT CD tutorial? 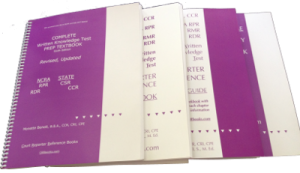 It’s the only NCRA and state WKT textbook and the only interactive WKT CD tutorial. * A workbook accompanies the textbook. ** A companion study guide is the companion book for the workbook to cross reference and detail correct and incorrect answers. Each book and CD has concise, well-organized material. What is the success? 98% first-time successful pass rate since 1990. 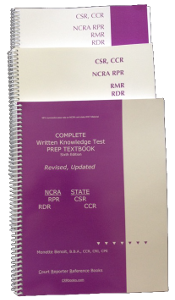 What is the difference between the NCRA RPR, RDR Test Prep WKT Workbook and Test Prep Companion Study Guide? * The Study Guide explains why Workbook answers are correct, incorrect, specifically where words are used as a d/a, distracting answer. The Test Prep Companion Study Guide is a companion book to the Workbook and may not be used alone. The “CRRT” is the only interactive NCRA RPR, RDR, and state CSR, CCR CD tutorial software program to assist individuals to pass NCRA and state written exams. WKT ’CRRT CD Tutorial’ is interactive, fun. Includes mock tests. What will the NCRA Test Prep RPR, RDR, CSR, CCR books and NCRA RPR, RDR WKT CD do? Save chunks of time. Go beyond memorizing test questions, multiple choice answers. No question is asked exactly the same way, so memorizing a question and memorizing multiple choice answers is not the key to ensuring success. What is the key to ensuring success? Learning how to answer WKT test questions. Learn method of studying, then pass that NCRA RPR, RDR and state test! 3. What is the Real-Time Vocabulary Workbook? It’s the only vocabulary workbook that has an answer key and a thesaurus answer key to further expand word vocabulary and a dictionary. 4. What is the CATapult Real-Time Dictionary Building Program Series TM? It’s not info you merge, import or overwrite into your dictionary. CATapult Dictionary Building CDs are the industry’s leading tool for building your dictionary, which you customize. Pass NCRA CRR, CBC, CCP certifications. Be prepared for class dictation, tests, depos, court, CART, captioning. Huge and Important: CATapult’s the only dictionary building program where you open your CAT translation software AND dictionary to see it running AS you write. Why is it important to see your realtime dictionary open while you enter words? When you write words against your dictionary, you detect problems, potential conflicts AS YOU build! No worries. No surprises. CATapult is the only dictionary building software program that has a specifically designed feature ’Create Your Own Category’. Perfect for tests, jobs, court dockets, expert witnesses, challenging material, finger drills, more. The only real-time dictionary building software program where you listen, view all words. The only real-time dictionary building software permitting you to view your dictionary and realtime words you choose, you customize. The only real-time dictionary building software program where you adjust speeds. The only real-time dictionary building software program where you get rid of errors in minutes. The only real-time dictionary building software program where you go beyond merging, importing. Really — are you going to print out your entire dictionary comparing each word? No need to print your dictionary to avoid conflicts when you use CATapult CDs. Review – Preview – Build. And check out the multiple FREE features. Need a career tutor, private coach? Are you a home-study student, enrolled in a program, a court reporter, a professional with goals? FREE articles – captioning, CART, students, court reporters, NCRA JCR “Beyond The Comfort Zone” by Monette Benoit and blog Monette’s Musings, www.monettebenoit.com.